This Weber Q3200 review shows that it is the newer model of the Q320. After 2014 the Weber company update the whole Q series. In this Weber Q3200 review we will give you all the pros and cons of this Weber gas grill and updated customer reviews. This Weber grill has been and still is a very popular model. It comes with the highly appreciated grill cart. The large wheels make it very easy to move. The 2 stainless steel burners makes it very easy to use for many temperature settings. This newer model and the way it has been changed give some improvements and take away a few of the small complaints the older model had. The larger grip handles make it easier to move around. The control knobs seem to work better and all these little improvements means in my opinion that the Weber company pays close attention to what there customers tell them. TIP! Click here to see the price! This newer model of the Q320 has the same great feature of the older model but is restyled and looks a lot nicer. The control knob and handle are larger and easier to use. The side tables are made more study and in combination with the ergonomic new handles this is a nice improvement. The side tables can still be fold down. This Weber gas grill is available in a propane gas and a natural gas edition. You also have to choice between the colors white and red for the lid. The grill still comes with the split grates that will give the opportunity to replace one of them with a griddle for breakfast cooking. This griddle is sold separately. The extra grate or griddle can be stored in the grill with the gas tank. The Q3200 is considered a high end grill not because of the price but because of the quality. Many people look for a quality grill that is why we did high end grill reviews for if you are looking for a different grill. There is a 462 sq inches of total cooking area and this includes a 75 square inches for the warming rack. This is a lot larger than for example the Weber q 1000. This gill runs on a 20 lb propane gas tank or on natural gas depending on the model you purchase. There is a 462 sq inches of total cooking area and this includes a 75 square inches for the warming rack. This means that the grill area is about 387 square inches and with the rule of thumb that you need about 72 square inches per person makes this grill good for a 4 people to cook at the same time. However most of the time a grill is used for hamburgers, hot dogs or chicken or grilling steak. This means that you can load it with a lot more. When you apply the rule that a hamburger needs about 20 square inches you can cook about 18-19 hamburgers at a time on this Weber grill. Although the height between the grill grate and the top of the lid is about 10 inches I think a chicken would not fit to well, but let me know if you have different experiences with grilling large cuts of meat on the Q3200 gas grill. Since the burners are in the middle and not on the side I think indirect grilling is not easy on this grill. Although with just the middle burner turned on and the food moved to the back or the front of the grill you might consider this indirect grilling. Find the current price here ! TIP! For The UK find the lowest price here! When we read customer reviews and publish some quotes here we always look for the reviews that actual buyers have written. We do not just look at the high ratings, but start at the lower ones to see if we can find negative points that come back more often. In this way we try to present you with real reviews. It is not easy to find many cons of the Weber Q3200. Some people tried to compere it with a summit grill, but I think that is wrong. The summit is much higher priced and a total different grill. Most people give this grill very good ratings and are happy with it. 1 or 2 of the almost 150 reviews we read mention the grill not getting hot enough. This could be caused by the safety feature in the regulator and you can check how to fix that in our post about how to solve gas grill regulator problems. just click on the link. If this does not solve the problem send it back. Most of the lower rating are in my opinion from people who did not read the specifications of this grill to good. They expected a smaller grill or did not like the fact they could not add lava rocks, a rotisserie or thought the plastic parts felt a little cheap. The model number for the Liquid propane grill is 57060001 and for the natural gas model 57067001. 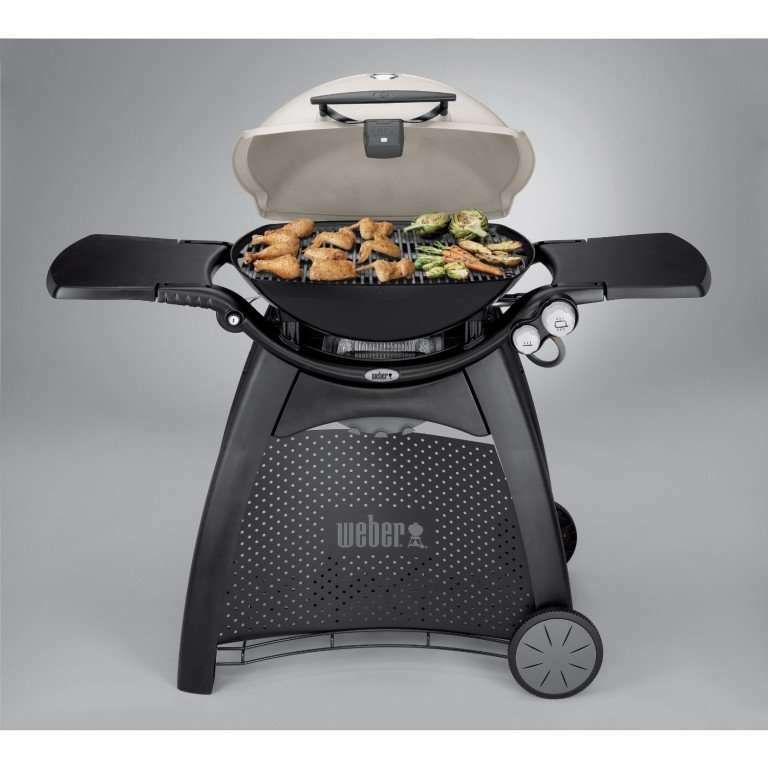 With the two colors, white and read available this Weber Q grill can fit any situation. The battery operated ignition functions pretty well and although it is not my favorite and I prefer the push button type, I could not find many complaints about it then the normal replacement of the batteries every year. It runs one a AA battery and this is included in the box. The grill comes almost fully assembled and just needs some minor assembly like the pins in the hood and someone mentioned that he had to fasten 4 bolts on the legs. All you have to do in most cases is put the grill grates in and you are good to go. If you lower the side tables you can use the smaller standard 6553 model grill cover. If you do not like to fold them down you will have to look for a much larger grill cover, but we found that the Weber 7112 fits the Q3200 and the older models read the Weber 7112 grill cover review here. This grill will be great for patios and even on a balcony. Some balconies might be a little smaller then the grill is wide but with one side table folded down it should fit. The width with the side tables up is 4 foot 10 inches and with the tables folded down 3 foot 3 inches. Cast aluminum lid and body. This is one of the more common applications of cast aluminum. The creation of cookware. Just as cast iron is used for skillets, baking pans, and other kitchen essentials, aluminum can also be used for these items. It’s much thicker than pressed aluminum, which makes it more resistant to warping or damage. Cast aluminum is also better at retaining heat than pressed aluminum because it is thicker.This lid is not welded but mad out of one piece of aluminum. The light on the grill handle was mentioned as very handy. Like I mentioned I am not a big fan of a battery operated ignition, but the one on this Q3200 seems to work pretty well. I am a big fan of the porcelain enameled, cast iron grill grates. The cast iron retains the heat very well and the enamel makes it easy to clean. The cart and the large wheel received a lot of good ratings. This makes it easy to move around if you would purchase the propane gas version. The Weber Q3200 natural gas model comes with a hose to hook it up to your gas line and the propane version comes with the hose to hook it up to your propane tank. 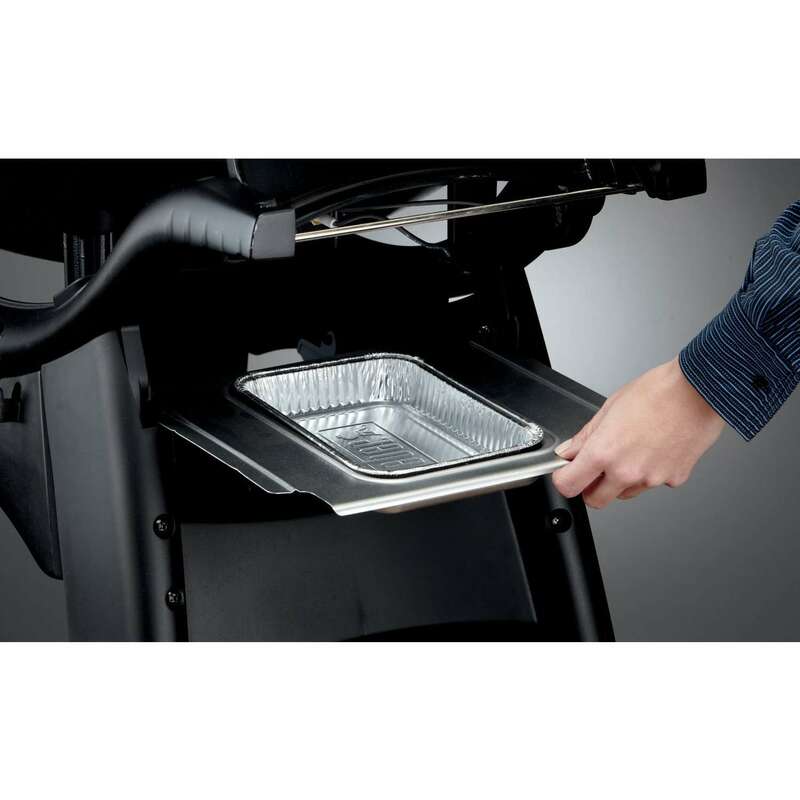 The warming rack can be taken of the grill and placed inside the cart for holding and storage. One of the nice features is the fact that this grill has split grates. In this way you can replace one them with a a q 300 series griddle and use it for cooking a breakfast. There are of course hooks to hang your grilling utensils. The nice cart covers your propane tank and keeps it out of sight. The newer control knobs have of course the infinity feature. This means that the flame can be controlled from low to high without any steps but in any stand. There is a different knob for both of the burners to adjust the temperature from low for a kind of slow cooking till high for searing a steak. Both version, propane and natural gas, come with their own hose and connections. There was one person who asked if he could hook the propane version to his large propane tank for his house. I personally see no problem because the grill comes with its own regulator, but I advice to call Weber or a local installer to make sure this is possible. This brings me to, what I think, is an advantage of the propane version. The option to move it around your yard, patio or deck and not being stuck to one spot because of the natural gas lines. The Weber BBQ grill has the option to use a smoke box for extra smoke flavor just like most grills. I read a tip to add the wood chips to the grease drip pan. Although we usually do not make to many recommendations we have found the Weber Q3200 best price in the online stores and you can see the price by clicking on one of the links. Overall this Weber Q3200 gas grill deserves the average of 4.7 stars and in our opinion we can recommend it as a good buy and enough bang for you bucks. It was even mentioned as one of the best high end gas grills on a page I found. Like always we try to find items and product to make the use of any grill easier and a more total experience. For the Weber Q3200 we found the following products and ideas. Like all new grill start it and let it get hot for about 20 minutes to burn of all the oil and grease that is use during the manufacturing process. This is also recommended in the Weber Q3200 manual. 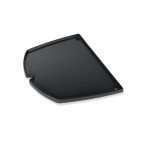 Like always we recommend the use of a quality grill cover for a grill and the Q3200 is no exception. We have found the 6553 for to protect your Weber from all weather and make it last for many years. 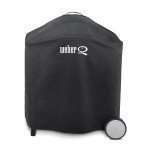 The top rated Weber q3200 cover and in general for the Q300 and Q3000 series is the 6553 grill cover and we will review that on it own page. The 6506 griddle you can be used to replace one of the split grill grates and use the q320 and the newer q3200 for breakfast cooking. Eggs, pancakes bacon and all other breakfast items will cook great on this griddle. 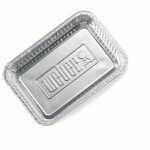 The drip pans for the Weber Q3200 and other models are very cheap and available on line. Order some when you order the grill. Of course you can have a look at our grilling accessories and find more items to improve your grilling experience. We hope you enjoyed this Weber Q3200 review and have found it useful.